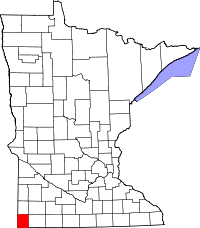 Rock County is one of the only counties in all of Minnesota doesn't have a single natural lake within its borders, most likely due to being located in the absolute southwest corner of the state, bordering South Dakota to the west and Iowa to the south. The Auditor-Treasurer for the county handles the vital statistics from the area, issuing copies and accommodating genealogy searches through its records, most of which are listed from the early 1870s. The fee schedule for requesting records is included on the website, as well as all necessary application forms which can be mailed or submitted in person at the Auditor-Treasurer office in Luverne, MN, on 204 E. Brown Street. The Rock County Historical Museum, also in Luverne, maintains a collection of county records, as well, which can be accessed either by appointment, or by visiting the museum during its somewhat limited hours of operation.